In Sebastian, Florida where I got to hang out with my friend Diane from my days working at Pearl Harbor. 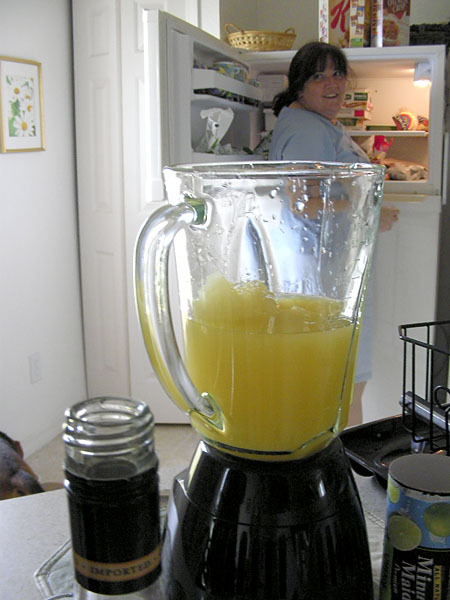 Here she’s getting some ice to whip-up some margaritas, made of tequila, frozen limeade, orange juice and ice cubes (can’t remember if I’m leaving something out). Diane, you’ll have to leave the recipe in the comments. Great stuff on a hot Florida day. We took a long drive to Kennedy Space Center to pick-up tickets for tomorrow’s shuttle launch and to visit a gator farm. 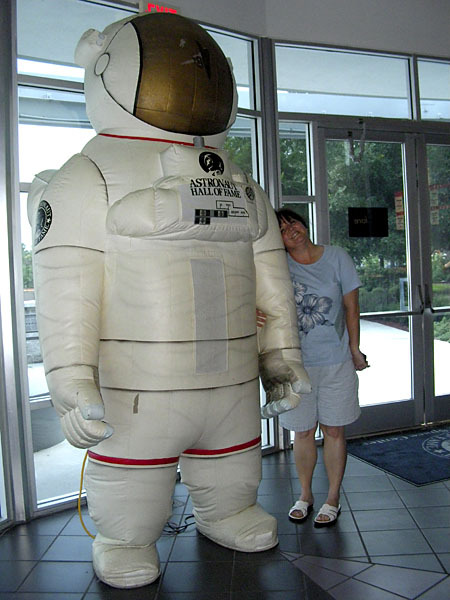 Here’s Diane next to some big blow-up astronaut thing at the Astronaut Hall of Fame. We did get the tickets but we opted-out of the gator farm as monsoon-like rain was in the area. And some guy was pointing at our Jeep Liberty excitedly but when I rolled down my window he sped-off in the rain. We drove further on and another excited driver on our left this time waved and pointed to us and finally told us we had a flat tire. We couldn’t feel the flat while driving. So we pulled over where it wasn’t raining and i did like a pit-crew and changed the tire. It had picked up a nail and a screw so it was pretty flat. That’s me putting the flat tire on the back of the car. 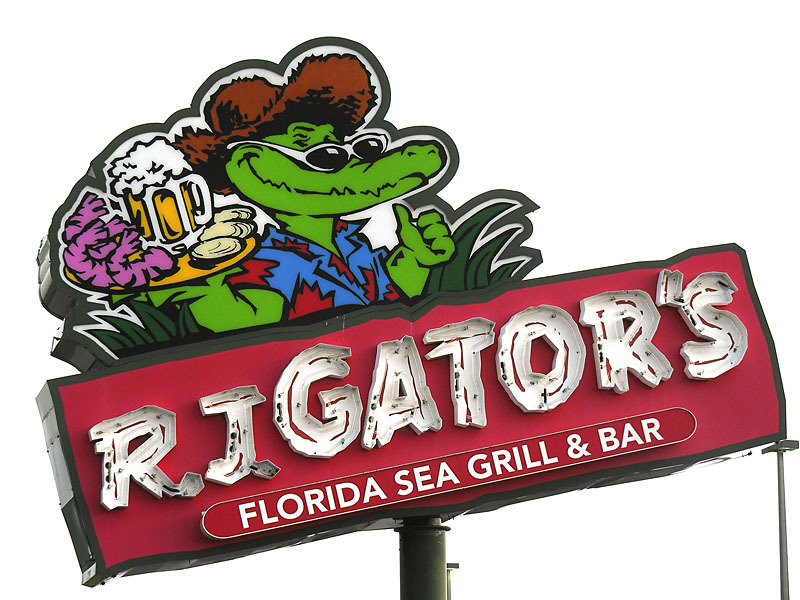 Since we didn’t go to the gator farm for a chance for me to get bit by a gator we headed over to R.J. Gator’s so I could do the biting. 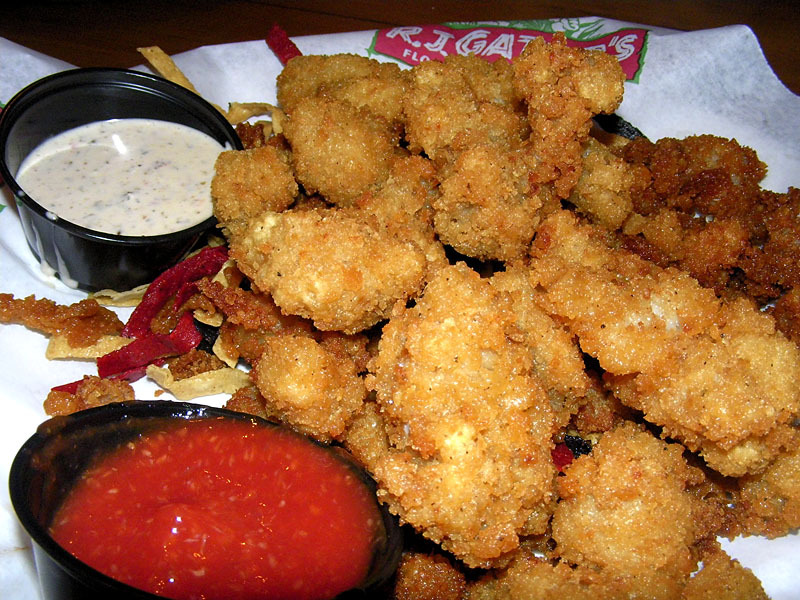 R.J.’s serves Gator Tails, deep fried breaded gator tail meat. Came with some kind of creamy Caribbean dressing and cocktail sauce. 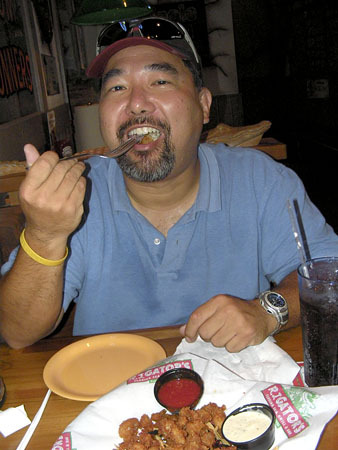 Here I am having a few bites of gator tail. We got a small batch at first so our waitress brought out extra gator tail later. Does alligator taste like chicken? I would have to say it tastes like a cross between chicken with a dash of beef or pork thrown in. The meat itself had the consistency of Chicken McNuggets, that spongy type mystery meat. So if you like McNuggets you’ll probably like deep fried gator tails. It would probably be excellent with McDonald’s honey-mustard sauce.